…and on this road trip you will traverse various types of road surfaces and weather conditions, you will cruise long stretches of smooth comfortable highway, encounter tight mountain switchbacks, as well as washboard dirt roads littered with rocks leading to some out-of-the-way camp site locations in the deep woods. With vehicle cargo capacity disregarded, for this journey what vehicle do you imagine driving — Porsche 911? Jeep Wrangler? A big Cadillac Escalade? Choosing the right tires for your bike is a similar experience depending on the style of riding you want to accomplish, the style of ride you enjoy most, acceptable compromises of performance to function and ability, and also the kind of environmental challenges you may encounter. For instance, if you most favor those winding hairpin mountain switchbacks you’re probably going to choose the Porsche 911… but will the 911 also get you down those rough dirt roads to your campsite? A Jeep Wrangler will certainly allow you to enjoy the off-road driving taking you to your campsite, but you’re probably getting zero thrills getting there when slowly navigating through those mountainous switchbacks in a Wrangler. Learning from the above scenario, you can begin to better understand the importance of choosing, “the right tool for the job.” One tool may be able to accomplish all of these jobs but the performance of that tool will be most capable for the task it is most intended for, and this is the exact point that can be made for choosing the right tires for your bike. 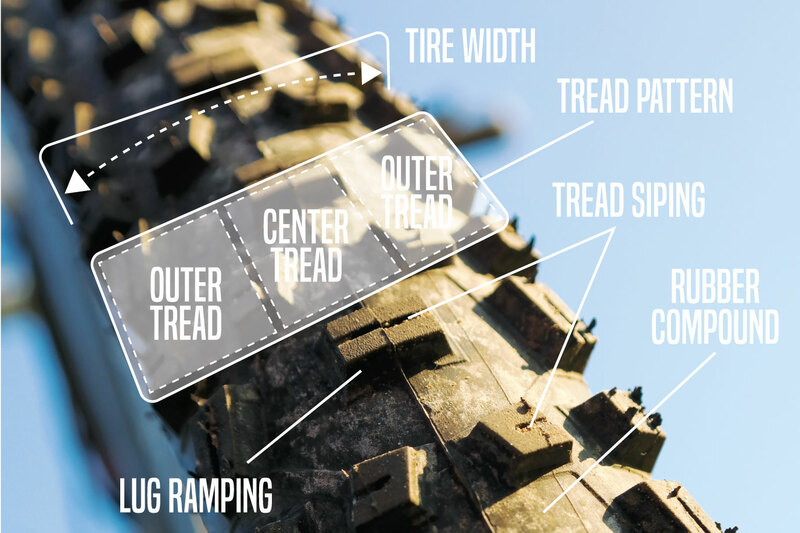 There are many factors that go into designing tire treads and patterns, however, tire treads at their core are designed as an inverse of the surface being ridden upon. Smooth surfaces match to slick treads, while loose bumpy surfaces are best matched to taller more generously lugged treads. Slick – Ideal for smooth surfaces so to maintain the largest constant contact patch possible with the ground surface. 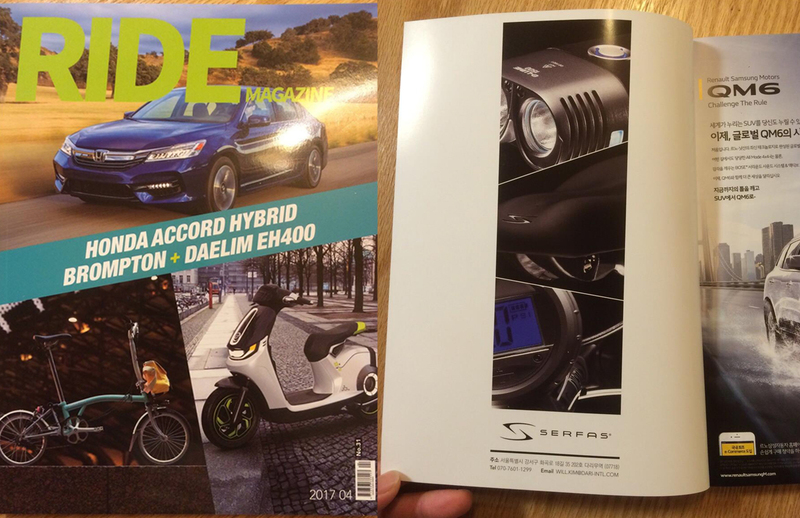 Example Surfaces: Road, Tarmac, Pavement, Hardpack, Asphalt, Indoor Track, etc. Knobby – Ideal for rough loose surfaces so to maintain the largest constant contact patch possible with the ground surface by, “biting,” the surface. Example Surfaces: Gravel, Dirt, Sand, Rock, Mud, Grass, Leaves, Roots, Branches, etc. 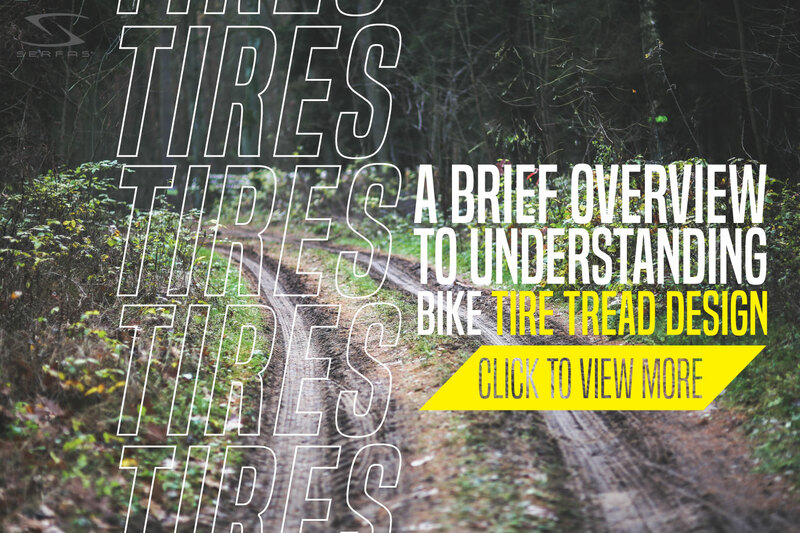 Many factors are taken into consideration and designed into a tire tread, some are outwardly exhibited and, for the most part, fairly easily distinguishable so long as you know and understand what to look for. 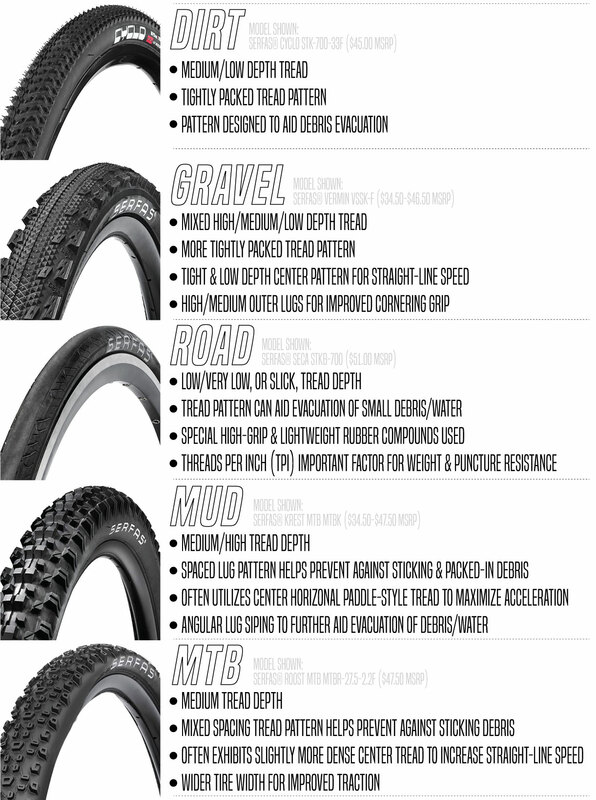 Below is a breakdown with brief description of each of the above labeled tire parts that effect ride and performance. Tire Width – Tire width has a dramatic effect on speed and grip, the wider a tire is the more grip it will have because it increases friction and enlarges the contact patch of the tire with the riding surface. Alternately, the more narrow a tire is the greater potential there is for a faster tire due to a smaller contact patch and less rolling resistance. Tread Pattern – Tread pattern, as a whole, is comprised of sections objectively designed to accomplish specific desirable characteristics that correlate to better handling, grip, and speed; additionally molded channels in the tire can help evacuate water and/or other small debris out and away from the tire to maintain grip with the ground. Outer Tread – Located on the sides of the tire tread pattern. The outer tread is often made up of short to tall grippy lugs for added grip on rougher surfaces. Additionally, the outside tread section of the tire can be manufactured to a different durometer, or “hardness,” to provide different handling characteristics. Center Tread – Located in the middle of the tire tread pattern. The center tread can be nearly smooth for straight-line speed, or alternately, covered with large lugs for lots of off-road grip. The center tread can also be manufactured to a different durometer, or “hardness,” when compared to the outer tread to provide different handling characteristics. Tread Siping – Thin slits cut or molded into the surface of the tire tread. These thin slits are designed to aid traction in wet slippery surface conditions. Lug Ramping – Ramping, or angling, of the front leading edge of individual tire lugs in a tread pattern, commonly found on tires indicated to have a directional-specific bias of rotation. 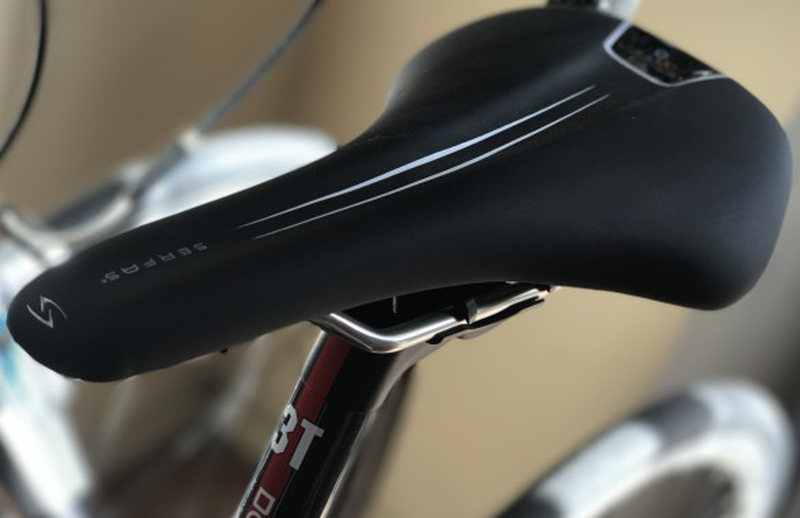 The ramping of the lugs is usually concentrated along the center tread and supposed to increase straight-line speed potential. Rubber Compound – Overall, a tire is manufactured using proprietary blends of rubber, silicone, and other ingredients that aid grip, longevity, and puncture resistance. Durometer, or hardness, of the rubber is also engineered to positively effect grip and handling characteristics as well as durability and tire life. 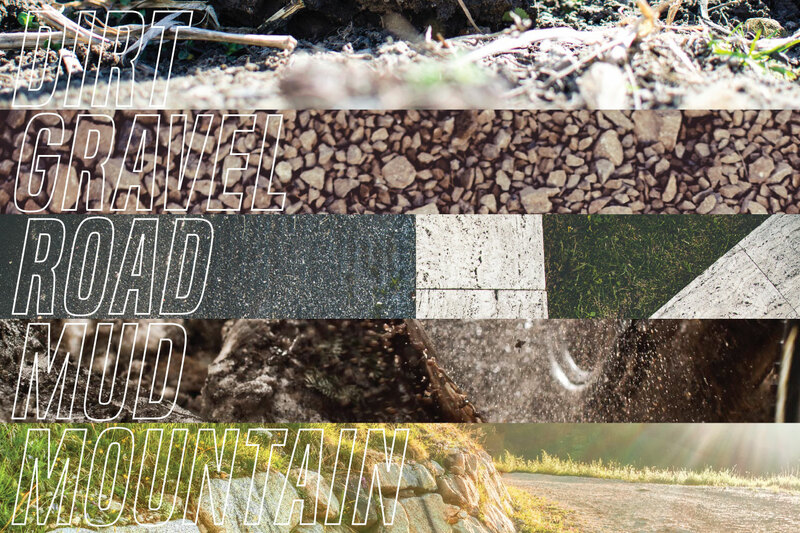 Serfas© offers a wide range of tires suitable for various environments and all kinds conditions, from Road to Mountain and everything in-between. The following categorizations below exist within this Blog Post as only a recommendation of matching appropriate tread pattern to an intended environment of use.